Its name comes from the Latin "aqua marina" meaning "sea water". It is sometimes called berylite or chrysolite from Siberia. The aquamarine is a variety of beryl. It is transparent with a light blue color reminding of water and the sea. It can be heat to increase its brightness giving it more value. The biggest aquamarine ever discovered was found in Brazil in 1910 and would weigh about 110 kgs. This stone has been known since the antiquity as the stone of sailor, because of its color. 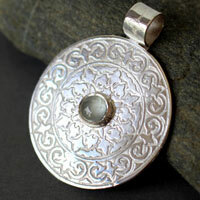 Sailors would wear it as a talisman against seasickness, storms and to come back safe and sound from long travels. People also used to think that wearing this stone would attract richness and luck. Romans would use the aquamarine a lot in jewelry. According to what they believed, if you engraved the drawing of a frog, it could give you the power to reconcile enemies. Greek people thought that the aquamarine was the mermaids' treasure. Chinese people associate the stone to the goddess Guanyin, the great compassionate. She is an important goddess in the Chinese culture. She is the goddess of pity, compassion and unconditional love, protector of women and children. The Mayas would associate this stone to Akna, the goddess of maternity and birth. 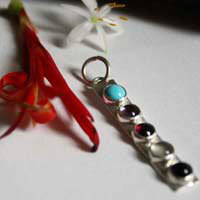 In the slave mythology, the aquamarine is associated to Kulapa, goddess of herbs, magic, and of the summer solstice. She is often considered as the water mother. In the Middle-Ages, alchemists would use the aquamarine to avoid fluid retention and to improve digestion. It was also thought that this stone would act as an antidote against poison. This is the reason why a lot of nobles would own such a stone. It was also thought that the aquamarine could rekindle love for married couples. However, in the Middle-Ages, divination comes as a new practice. Aquamarine was especially used in the making of crystal balls, and in other ways to read the future. For example, the fortune teller would hold a crystal of aquamarine at the end of a string, just at the surface of bowl of water (link between the stone and water). The edges of the bowl were marked with different letters of the alphabet that the stone would hit to spell the answers from the underworld. People would also try to read the future in the waves of the water in which one had put an aquamarine crystal. The stone was also associated to Saint Thomas for the sailor symbol because the apostle travelled a lot by boat to bring the Good News to new territories. It is the stone of the traveler. Mines: Afghanistan, Brazil, Australia, Pakistan, Madagascar, the USA and Norway. The aquamarine would be effective against pollen allergies. It would help to get out of depression by getting rid of tensions and stress. The aquamarine would be recommended for mandible and teeth problems. It would be good for eye problems. The aquamarine would be very helpful for kidney and lymphatic system problems. It would improve the body defenses and more particularly of the nervous system, the bladder, kidneys and liver. The aquamarine would be effective for the anemia treatment. It would help to eliminate the fluid retention by stimulating the elimination of toxins in the body. The aquamarine would relax the cervical contracture. It would cure some skin diseases like eczema, hives, acne, herpes and would be useful against shingles.